After arriving home from sunny New Zealand, I’ve been watching the snow accumulate here in Seattle for the past week. 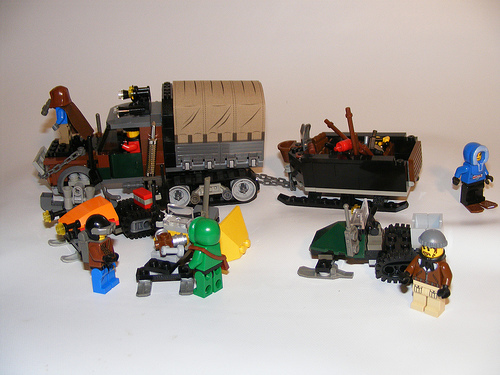 This looks like a great set of vehicles for navigating the frigid wasteland, and a cool group of minifigs to hang out with along the way. I could really use some global warming. Yeah, I live a bit outside of Seattle and we’ve got two feet of snow in some places…A Snowpocalypse doesn’t sound so crazy right now. The good thing about a snowmageddon is that there are NO ZOMBIES. You see, they wouldn’t be able to move around because their bodies would freeze solid! ^ actually it might make sense if you know the science instead of going off the name. I don’t know much more than you do (well, in this case) but it’s rarely a good idea to make dumb comments when you don’t know what you’re talking about.